Telford and Shropshire is celebrating in style after the recent announcement that it has won the bid to be host destination for Europe’s largest archery tournament and trade show next year. Hosted at The International Centre Telford, the prestigious European Archery Festival 2014 will run from the 24th to 26th January 2014 and will see nearly 1,500 competitors from over 30 countries travel to Telford for the three-day long tournament. Tickets will be put on sale later in the year for all three days of competition, including the arena-style broadcast final, allowing residents and visitors to see some of the world’s elite sportsmen and women in action. Billed as a true festival of archery, the organisers have designed the event to be much more than simply an elite tournament though, and it will see numerous opportunities for residents and visitors to try their hand at archery, as well as access one of the most inclusive archery trade shows ever run alongside a competition. “Work is also starting now on our sponsorship and hospitality packages, with corporate trips and archery have-a-gos all in the planning stages. We’re inviting interest from any businesses across the region who would like to benefit from the opportunity of such fantastic exposure, and further information can be found on the event’s website www.europeanarcheryfestival.com” he concluded. 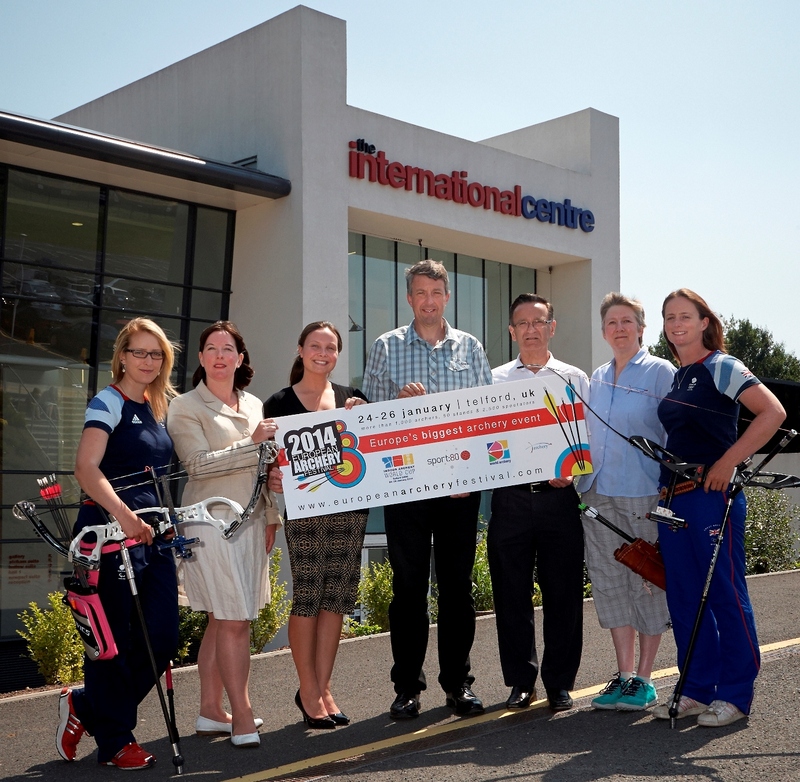 The announcement about the bid win was made at The International Centre, Telford, where double Paralympic champion and three-time World Champion Danielle Brown MBE, and three-times Olympian Naomi Folkard joined members of Archery GB and the event team to mark the occasion. “I was delighted when Telford won the bid to host the event next year. To see this festival come to the town where I’ve made my home makes me enormously proud, and I’m really looking forward to competitors and visitors to the event seeing for themselves just what we have to offer.” explained Danielle Brown. Tom Gray, Chief Executive of the Southwater Event Group who will be hosting the event added: “We’re understandably delighted to have secured the European Archery Festival for 2014. It’s fantastic news and a real coup for Telford and we very much look forward to welcoming thousands of competitors and spectators from all over the world, and sharing with them the exceptional hospitality for which we are so renowned”. For more information about sponsorship opportunities please contact gary@sport80.com. And for the latest on what is happening in Telford & Shropshire as well as access to the Convention Bureau’s free Event Organiser Support services please visit www.meet-telford.co.uk .